Eagles Nest Luxury Mountain Retreat offers its guests a unique, completely secluded and relaxed mountain Chalet Experience. 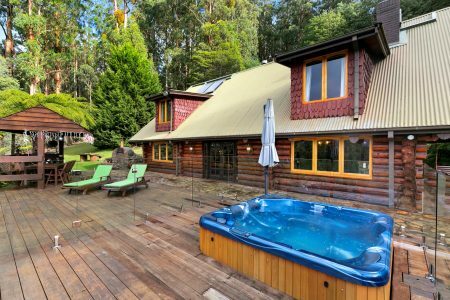 The hand crafted log Chalet is on 10 acres of untouched historic bushland surrounded by unforgettable scenery and views that are out of this world. Whatever the reason for your stay you will find yourself in complete comfort. Come in and sit by the open fire or simply relax in the sunken spa with a bottle of local wine. You will have a feeling of being the only person on earth. The property consists of a large outdoor entertainment deck, complete with BBQ, dining area and an incredible Stone Wood Fired Pizza Oven, sunken spa, stunning open fire place, Gas Log Heater and reverse cycle air conditioning/heating. 3 Bedrooms allowing for 1 King, and 2 Queen size beds. All towels and linen provided. Suitable for families.